You might also try www.thorlabs.com who produce opto-mechanical parts which can be used to build stuff - using 1/4" x 20tpi which fits tripod threads, or M6 - some of their parts could be used if you like mechano! I use them for all sorts of things - they manufacture in stainless steel and anodised aluminium. Not cheap but probably cheaper than getting stuff machined unless you diy. I've just spent two weeks diving in west Scotland with an A7II. Its a frustrating camera. It is capable of very good results indeed but it was a real fight to get it to operate as I wanted it to. And yes AF can be messy - it is happy to focus on suspended matter and persuading it not to was not always easy; over mud there was a lot of suspension. I can't compare it to an 810 but I still think that it and dSLRs are simply significantly different and have differing strengths and weaknesses. Battery life surprised me - 2 x hour plus dives in cool (13~14C) water without problem but I was not shooting video at all. I was interested in using the camera because its great strength for me is weight and I'm happy with it but I still have a housed dSLR too (with fisheye), so best of both worlds. I'm really torn over the A7 cameras - they are very capable, small and light and versatile, but frustrating in use both above and below water. I use it with Sony (above and below water) and Leica M lenses (above water). When I searched I found it difficult to find any information on this lens for use underwater before buying it. Having now bought one and tried it, I thought it worth a short post. I dived in the Menai Strait yesterday (very good vis for the Strait at ~5m and 10 degrees C), first time out with an A7II in a Seacam housing with the 50 macro lens - using a Seaflash 150 manually for illumination. The lens is a 'conventional' (extending) type design which is not as convenient as an internal focus type lens but retains its focal length 'better'. This does mean that a longer port has to be used to allow for its extension during focus. Its focus speed is also quite slow but I bought it for use in UK waters and mostly for benthic stuff so this isn't too much of a worry and in practice it was less problematic than it sounds. I had concerns about battery life with the power used to drive this lens too but found that an hour long, coolish dive didn't flatten it so this was unfounded. Anyway, results. Despite using the rear screen only and there being slight current at times (we went in just before slack and got out just after - as is the way with the Strait) focus was very accurate indeed, even on small subjects. I didn't push it down to 1:1 but got close. Mid range was excellent too. Here's one shot worth posting of something I've never seen here before. 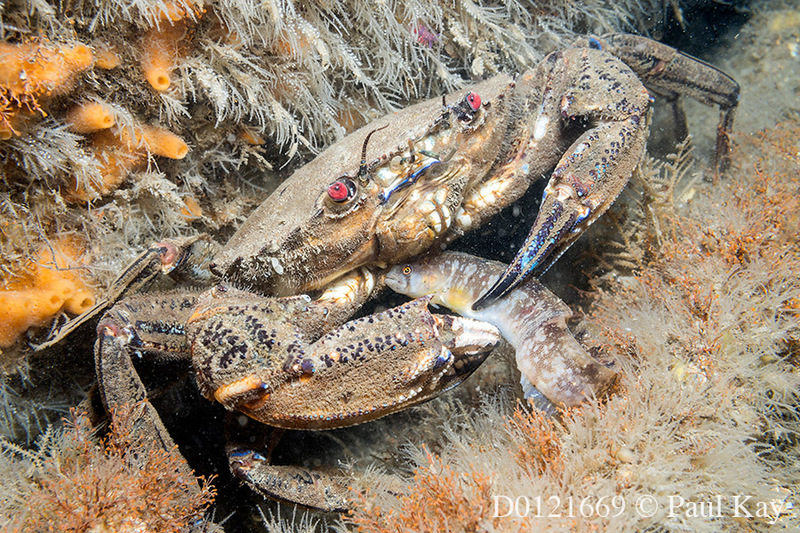 An incredibly slippery butterfish caught by a velvet swimming crab. Its very crisp indeed at f/14. I look forward to shooting with this lens - its surprisingly light in weight but an excellent performer. #382483 Any hands on experience with Nikkor 20mm 2.8D ? Caveat - I-ts a long time since I used a 20mm f/2.8D Nikkor underwater but I used to and I liked it well enough and it should still work well enough if situated correctly behind a reasonably sized dome port (Seacam, which I supply, certainly suggest that it is ok behind both the WidePort and Superdome, and I'd guess it will work ok behind the CompatPort too). Basically a lens with a 90 degree field of view is about the limit of what used to be considered viable - in the (film) days when smaller domes were more the norm - although often they were used with diopters behind smaller ports. Today we are more critical but you should be able to get it to work well enough. If its not 'supported'- I assume that simply means that there is no recommended port/extender combination - this is possibly because fewer people use fixed focal length lenses these days and little data is available (I'm surprised nobody who uses one has posted). On the Seacam it simply sits behind the port with no extension and this is where I would start. Personally I prefer fixed focal length lenses and would happily use this 20mm lens if I shot on Nikon - Canon's offering has not impressed me above, let alone below water! On a recent trip we referred to this as 'by catch' and it can be fascinating to discover the unexpected and occasionally rare species lurking but unseen before viewing the photo. #363957 Is Social Media Creating Unrealistic Expectations? Therefore, does this profusion of perfect images create unrealistic expectations for beginners or casual uw photographers? Are new photographers frustrated when they see so many "perfect" images out there yet can't get the exact same results straight from the camera even with almost perfect strobe positioning? Do new photographers know there is post processing work done on these images or do they expect the same results all the time? I am not trying to start a debate about post processing etc but rather looking for opinions from newer photographers whether they experience frustration from high expectations due to exposure to social media? I'm not so sure that you can actually limit the unrealistic expectations to backscatter. #361872 Expose to the right? When digital information is underexposed, chips will strain to record information in the deeper values, and in doing so will produce digital noise. Ummmm. The darkest areas in the image will be just that - dark. Noise is only produced when you increase the gain (i.e. amplify the signal), so brightening/lightening shadow areas will increase their noise level - very simple. If they are important (more so than highlights) then underexposing them will lead to increased noise when adjusting later. Its got nothing to do with ETTR and lots to do with exposing for your preconceived requirement of output. ETTR in itself is in essence overexposing and as I have said before, can lead to tonal anomalies. So correct exposure must be made on the basis of the subject. Until we get sensors able to record much wider contrast ratios we are always going to be compromising somewhere. I don't see any real advantage to ETTR even in the low contrast conditions (which we compensate for by using flash) underwater. Gurus are great but actual practice is even better IMO. #361645 Expose to the right? I have tried experimenting with ETTR and 'normal' exposure. My personal conclusion is that ETTR offers little if any advantages in practice. My opinion FWIW, is that any increased information supplied by the biased exposure is IMO often undermined by subtle but often irritating shifts in tonality produced when readjusting exposure in post, which then require additional adjustment and on occasion I have found that they cannot be thoroughly compensated for. Blown highlights on the other hand are blown. In situations where the contrast is far too high for the sensor to handle I tend to try to decide what can be blown, if anything, and expose accordingly. On the subject of ISO, I tend, on my land cameras (digital Leicas), never to adjust from base ISO (160) and adjust/compensate underexposure in post. If you think about it, increasing ISO is pre-setting another adjustment in-camera - in this case 'gain'. Software has become good enough to allow 'gain' to be applied afterwards, to an underexposed shot. In many circumstances anyway. Problems do occur if too much ''gain is applied to the deepest shadows where banding can occur. With the Leicas this is almost negligible, on my Canons it can be a problem - clearly they are slightly different somehow (CCD vs. CMOS?). And when all is said and done I've also tried experimenting with 'inadequate exposure' and find that post processing can actually produce very acceptable results from mis-judged exposures. My own personal rules on photographic technique are that there are no rules. Photography is practical, if in doubt about what something will produce, try it and be objective about the results. It can be surprising and disconcerting. 1. How did it work for you? 2. Obviously you would have to set it before you close the housing, how did you control it? 3. Does the trigger button control when it starts and stops? 4. Has anyone tried Magic Lantern's TL? I have 3x 7d's that I would like to experiment with, but I would like a more secure method with my 1DX. Thank you ahead of time for any information you can provide. 3. On the Canon intervalometer its the 'start' button I think (I'll have to dig it out from the box its stored in if you want me to check, but its fairly obvious). 4. I haven't - looks like others have. Glass usually require special polishing and the problem is that grinding the damage away effectively can lead to heat build up which can shatter the glass - I know! But it is as you say, worth a try - find a glass repair specialist if you can. Why not ask the Aquatica about it? It may still be cheaper to have a new glass dome fitted than repace the whole port. #332432 Animal movies: Should they be real or embellished through artistic license? I guess the question is whether movie magic should be reserved for fiction, and natural history documentaries should endeavor to retain a certain sense of truth. As I see it, the problem IS defining truth. There is often an emphasis on filming 'rare' or previously unseen/unrecorded events in documentary film making. This in itself skews the viewer's perception of the natural world, as do many stills photographs. We seem to live in an increasingly 'virtual' world (laser pistols were used at the Olympics instead of air pistols as an example - do they really form part of a physical sport I wonder?) and the lines between fact, representation and fiction are IMHO blurring more than ever. I suppose my take is that if it does some good and it raises profiles and safeguards and allows animals to get on with living in the wild, then so be it. Claiming any natural history documentary is 'true to life' is actually quite difficult as any editing will form an impression in the viewer's mind which is potentially distorted by the condensation of time if nothing else. I suppose that claiming 'true to life' is where the dishonesty can appear - films and documentaries are all representational at the end of the day and it is important to appreciate this when viewing them and enjoy them for what they are. I imagine that this will be challenged in the EU as it will affect many non-UK photographer's too and will undoubtedly enrich lawyers with the potential violations and infringements that it will potentially lead to. I would say that this is a case of the insane running the asylum but I'm not sure that the word running is at all applicable. Why are we governed by such morons?